Last week the Phoenix area hit 100 degrees for the first time this year and it was the fourth earliest date on record. Thus, one would think that the season for outdoor events would be coming to an end. One would be wrong, as this past weekend brought in the Scottsdale Culinary Fest and the Scottsdale Civic Center Mall, an outdoor Taste of Chicago-esque festival showcasing food from all over the area and of all types. Some were household names with tons of locations around the Valley of the Sun, like Grimaldi’s and Zoe’s, but others seemed a bit more special and I sought them out (along with some booze, of course). I’d been hearing murmurings of how great this place was for a while now, and its victory at Burger Battle 2018 further cemented my desire to get there. 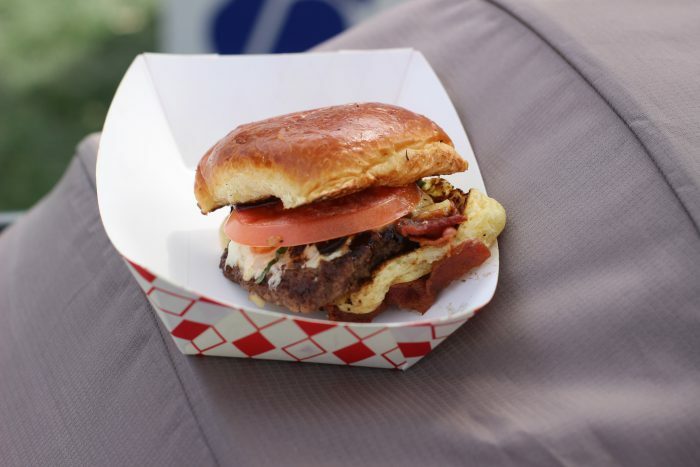 This burger wasn’t perfect, nor would I expect it to be in such a situation, but the combination of mozzarella, bacon, basil garlic aioli, balsamic reduction and a discarded tomato made me more eager to seek out the real deal.